I used to be so good at baking my own bread. I had a great sourdough starter and used to bake at least once a week, for us and for friends. Then I fell completely off the waggon. And even though I missed my own bread, I was too lazy to start over. But now I have a new starter ready and am very determined to bake again more often. If you don’t have a sourdough starter, it’s very easy to make one. All you need is flour, water and a little patience. Get started here. If you have never baked your own bread and the words “yeast” and sourdough” make you cringe – I’ve been there, too. My first loaves were barely edible. I overproofed them, I used way too much yeast or dead starters, I baked my bread into bricks. For some people bread baking is an easy task from the start. But for others it takes some time to get the hang of it: it takes a while to find out how long to knead the dough until the gluten is properly developed, to tell “proofed” from “overproofed” and when exactly to take the bread out of the oven can be another miracle. But believe me, you will get there. Just be a little patient. Sourdough bread is my favourite because to me it tastes better than homemade yeast bread. And it keeps fresh much longer. Another benefit is that bread that is leavened helps to absorb some nutrients better than unleavened bread. Plus, if you use whole rye flour working with yeast just won’t do it. This bread calls for 50% whole rye flour. 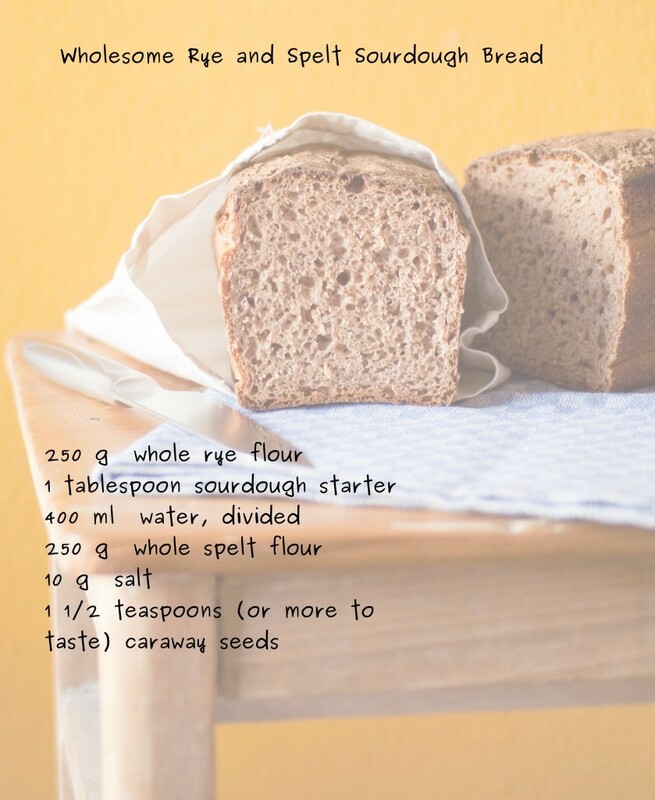 Rye flour acts very differently from wheat flour when it comes to baking. The gluten will never develop much and the dough will be rather sticky. Don’t worry about that, your bread will still come out fine. The recipe also calls for whole spelt flour. Spelt flour is a flour diva, if you ask me. Some people need a lot of water for their spelt baked goods. Otherwise their loaves will come out very dry. Others don’t need that much water. This bread calls for a very large amount of water not only because I am using spelt flour, but also because it will improve the crumb and moisture of this loaf. The consistency of the dough will be more like a very thick cake batter. Cover your bowl with a plate or plastic wrap and let sit for 12-16 hours. Your dough should look bubbly and have doubled in size. It should also smell sour. Knead the dough for one minute. It will be rather sticky (especially because of the rye flour) and rather soft. Cover and let rest for 10 minutes. This will help to absorb the water properly and develop the gluten. Knead again for one minute. You will probably note that the consistency has changed and that the dough feels a little bit firmer. But it still will be rather soft. Line a loaf pan with parchment paper. (Sourdough can be a little hard on your pans. That’s why you shouldn’t grease the pan but use some parchment instead.) Transfer the dough to the pan. Use wet hands and slightly press to shape it a bit. Cover with a damp kitchen towel. Preheat the oven to 220°C (425°F). Let the dough rise until doubled in size. This will take 1-2 hours depending of your starter, the room temperature, etc. Bake for ten minutes. Lower the temperature to 200°C (400°F). Bake for 30 more minutes or until a toothpick inserted comes out clean. (Even better if have a meat thermometer – it will finally be useful – you can insert into the loaf. The temperature should be 93°C (200°F). Let the loaf cool completely before slicing. You can also wait a whole day to cut this bread, this will improve the flavour.